Luxury Beach Condo, The BEST location at the Oceanfront! This luxury condominium is fully furnished and has a gourmet kitchen complete with stainless steel appliances and granite counter tops. With tile floors in kitchen and bathrooms, and quality furniture and fixtures this condominium is sure to please all who stay. Easy walk to the beach and boardwalk, shopping, great restaurants, and live outdoor entertainment at the nearby 31st street and 24th street boardwalk stages. This is the BEST location at the Beach! There is also a large pool on site for guests, (open seasonally from May through September). Enjoy this condo inside for it's luxury and security (coded access only) and outside for all that the Virginia Beach Oceanfront has to offer! If you are looking for a GOLF getaway, this is a great location that is convenient for any foursome. Enjoy the many nearby golf courses by day and walk to Beachfront restaurants and nightlife at night! If FISHING is your desire, nearby Rudee inlet offers both inshore and offshore opportunities, and there are many fresh water lakes close by as well. If you are interested in temporary MONTHLY off-season rentals please let us know. This is a great place for transferee's or temporary residents. The condo is 'move-in' ready and utilities are included in the monthly rate! Mark Sarrett Financial Advisor I work hard to treat my renters with the same professionalism and respect that I treat my clients! Great Cuban restaurant right next door. Grocery shopping is close walking distance. Beach is incredible. Entertainment all summer long at 31st street stage and along the Beach Avenue! 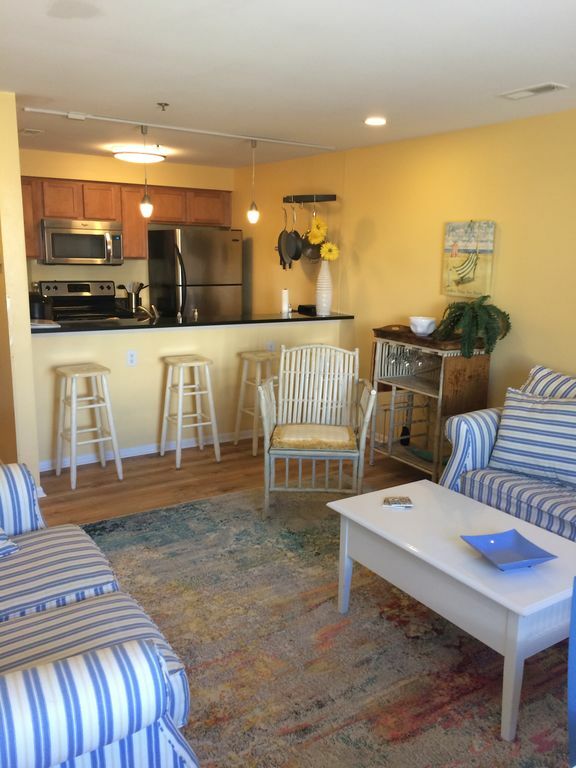 Boardwalk and Ocean Beach is short, easy walk to and from condo door! Grocery stores, shopping, great restaurants, boardwalk activities and events all within easy walking distance. Wireless internet, security and instructions provided inside the condo unit. Beautiful apartment with great lighting. Pleasant furnishings with great color choices. We enjoyed our stay and we would rent from Mark again. This was a very nice condo, very nice amenities, and overall a great experience. The condo was two blocks from the boardwalk which I was worried about being too far from the beach but it ended up being a nice buffer from all of the hub-bub. When we were spent from the beach we could come home and relax at the quiet pool. Most times we had the pool to ourselves. The condo was very clean and well maintained. Thanks again! Booked this condo for a family of four and we loved it. The location of the condo is fantastic. Close to grocery stores and the beach. Condo is equipped with every we needed. GREAT WEEK! The condo is located in the perfect location and is absolutely beautiful. It was very clean and comfortable. My entire family enjoyed the accommodations and would stay at Marks place again. This was the 4th year we spent at VA Beach in this condo. We love it. Mark is very prompt with responding to messages and maintains a comfortable, well furnished, and well equipped place. Great for families. This is the best location at the VB Oceanfront! Close enough to enjoy all that the resort has to offer, yet just off of Atlantic Ave to enjoy some quiet and privacy. Plenty of activities, eateries, etc. for all ages all within walking distance.